After actor Anupam Kher, Tanushree Dutta has openly supported Kangana Ranaut for fearlessly shouldering a big-budget Hindi film and fighting all who stood against her in the making of Manikarnika: The Queen of Jhansi. 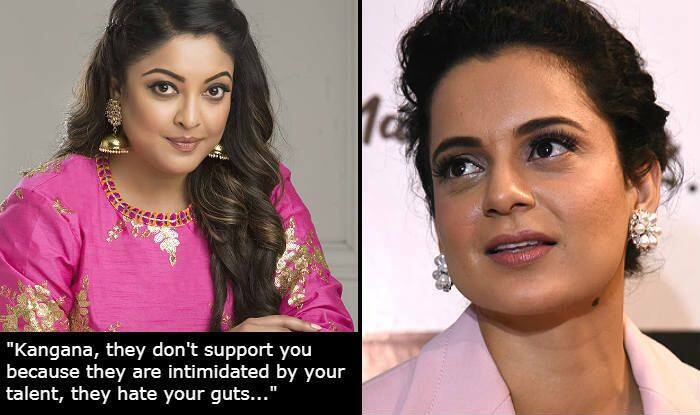 In her open letter to Kangana, Tanushree has written that Bollywood isn’t showing any sympathy for Kangana because most of them are ‘intimidated ‘ by her talent. She has also praised Kangana for standing alone and finding her own path of success without being in the good books of the industry people. She added, “I haven’t seen the film yet but my friends in the US recommended me to watch it asap so, perhaps, I will soon. My parents saw it on opening week and they are all praises, especially for your performance in it. Keep up the good work and keep being you!! Meanwhile, Kangana has called out Bollywood’s hypocrisy in not promoting her films. In her statement recently, she took Alia Bhatt‘s name and said that she went all out to promote Raazi while Alia never took pains in promoting Manikarnika let alone supporting her in the controversy that erupted during the release of the film.